A group of six Plymouth-based Royal Marines who have been running the South West coast path to raise money for charity are hoping to finish about lunchtime on Friday. The path, which stretches over 630 miles, runs from Minehead in Somerset to Poole in Dorset and takes in the Cornwall and Devon coastlines. The team from Stonehouse barracks set off on Saturday and expect to arrive in Poole before 1300 BST on Friday. The task has been made more arduous for the servicemen by the fact that they have been running in military boots and uniform. Running in pairs for each 10-mile stretch has taken about two hours, which means the Marines have had four hours to wash, eat, sleep and recover before setting off again on their next stint. The money raised by the event will go towards the Royal Marines Benevolent Fund and the Arthritis Research Campaign. The South West path may be extremely picturesque, but it has not been the easiest of terrains to run along. One of the runners, Captain Mark John of the Royal Marines Police, said some have coped slightly better than others. He added: "We're able to walk - just! "We're going to make it, but I think some of us will be visiting the medical centre on Friday afternoon." 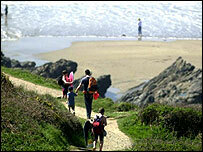 The South West Coast Path is the longest in a series of National Trails created and funded by the Countryside Agency. It was created in sections, with its final element in Somerset and North Devon opening in 1978.